Shelley Miller, vocals, Dave Johns, guitar and vocals, Hank Alrich, guitar and vocals – kick off the 2019 Plumas County Swinging Season, cozy in the the warmth and shelter of The Main Street Lounge. Come get your yahyah’s and your woohoo’s into the foot-wiggling rhythms and magic of Shelley’s singing. Watch Dave deliver another Epiphonic knockout. See Hank be amazed. Front row seats available only to early arrivals. Swinging Room Only (“SRO”) is a common situation, so baby, have your dancing boots on. 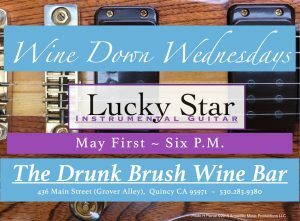 Shelley Miller, vocals, Dave Johns, guitar and vocals, Hank Alrich, guitar and vocals – three sets outdoors in the marvelously welcoming courtyard at The Drunk Brush Wine Bar on Grover Alley in beautiful greater metropolitan downtown Quincy, California. 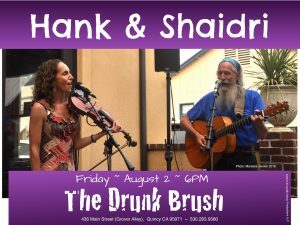 Hank & Shaidri, outdoors on the big patio at Quincy Courtyard Suites, nestled between The Knook, our 2019 Taste of Plumas Best of Show restaurant champion, and the Drunk Brush Wine Bar, which is now a certified scene along Grover Alley in Quincy CA 95971 USA, recently voted among America’s Ton 10 small towns. They got that right! 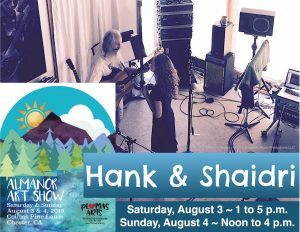 Hank & Shaidri pull from the traditional legacy of their historical predecessors, original work, and a great reservoir of contemporary writers’ material to create a special version of acoustic American string band music, one that appeals to many listeners, regardless of age or general musical preferences. 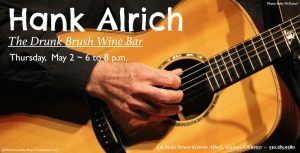 Three sets, six to nine post meridian, featuring all that fine music typical of any show with this dynamic daughter and dad duo. If you haven’t heard this you want to; if you have, you already know that.